A third cousin of ours, Barb H., who is descended from Ella Frances (Gorton) MacKenzie, sent me these photos today. Ella was a lot younger, 11 years, than Mary Augusta, her sister and our great grandmother. Do you think she looks like anyone in our family? 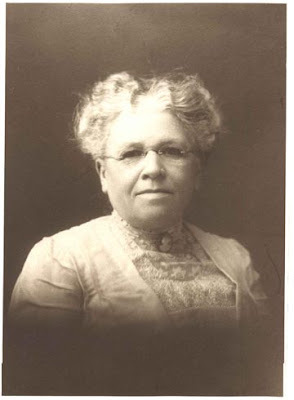 If that last picture, #4, above, "lady with the black hat," is a photo of "Great Grandma Gorton," that would be Lucinda Frances (Roberts) Gorton, (see photo we have of her below). The black hat photo could be from her younger days and the rounder face one below could be from when she was older. What do you think? Also, since this photo was handed down from the Roberts/Gorton line of the family, that means Barbara Hemerling, mother of Elizabeth (Meyers) Gates, is not a possible identity for this lady- wrong side of the family! The only other woman the black hat lady could be is Emaline (Hotchkiss) Roberts, wife of John Roberts, MOTHER of Lucinda Frances Roberts. She was born in 1805 and died in 1890. 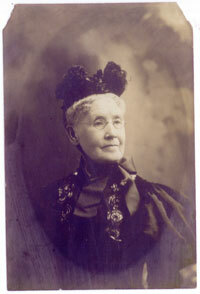 If the "lady in the black hat" was Emaline, and the photo was taken around 1880, then Emaline would be about 75 years old. Does this lady look that age? It's either a woman who doesn't age (Emaline) or it must be, as the caption says, her daughter, Lucinda Frances (Roberts), Grandmother Gorton. Mystery solved, would you say? 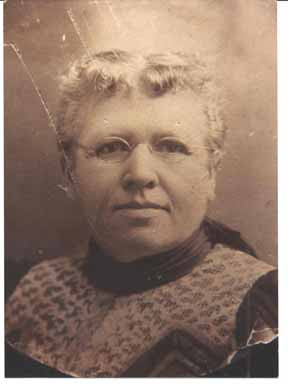 Lucinda Frances (Roberts) Gorton, aka: "Frances Lucinda"
Mary Augusta (Gorton) Myers: sister of Ella Frances. Mary A. and Ella were both daughters of Lucinda Frances (Roberts) Gorton above. Thanks Barb H. for your sharing of the photos of Ella.